The trees are in full blossom, frost doesn’t nip our nose each morning and the sun is finally coming out from behind a blanked of cloud. It means one thing – spring has arrived and is there anything better than making the most of a sunny day than having a long lazy lunch at a winery? 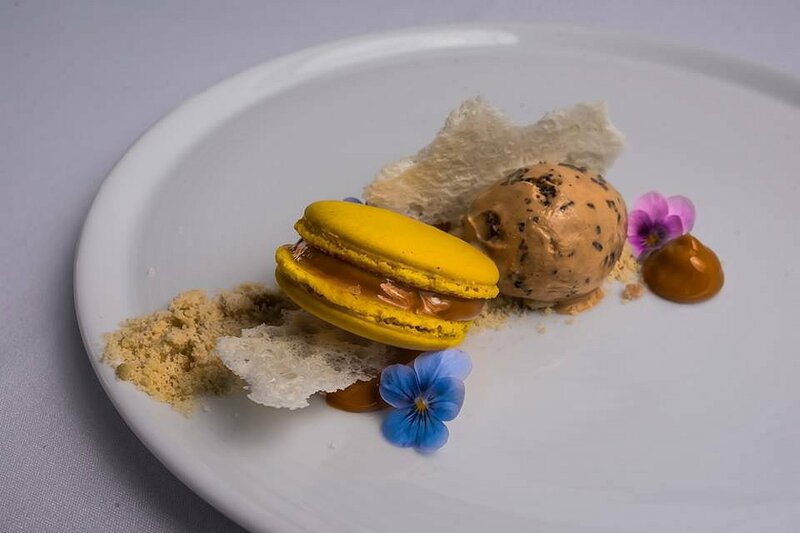 The kitchen team at Serafino Wines, under the guidance of head chef Daniel Armon have seemingly encapsulated the season of spring in their new season menu for your dining pleasure. 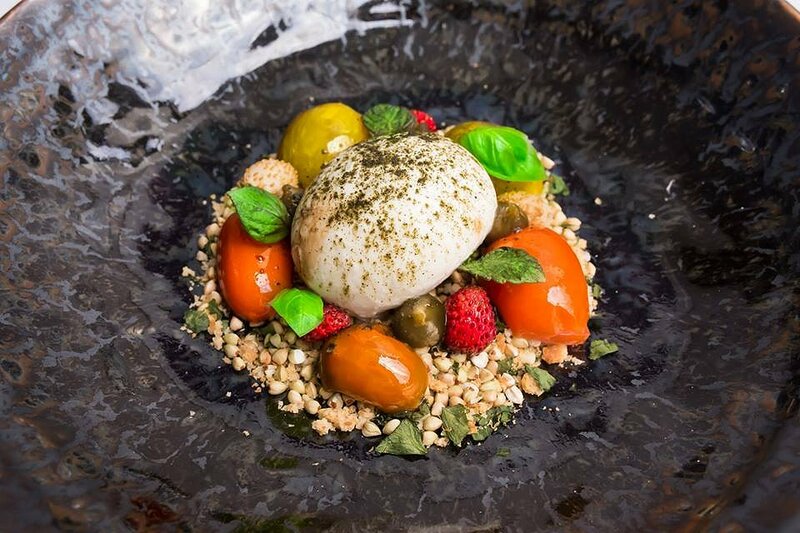 The ethos of the menu is an Italian focus, using traditional concepts and inspiration, modernized with Australian ingredients with the occasional Asian influence. 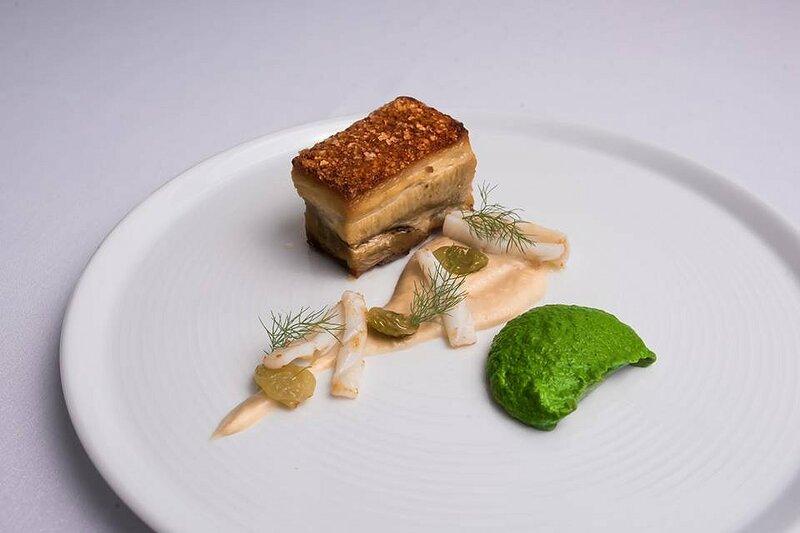 The breathtakingly beautiful Smoked Leeks entrée is reminiscent of a spring garden and competes with the beautiful Serafino gardens and lake that the restaurant overlooks. An airy asparagus mousse is topped with a sunny confit egg yolk that brings a silky richness to the plate. 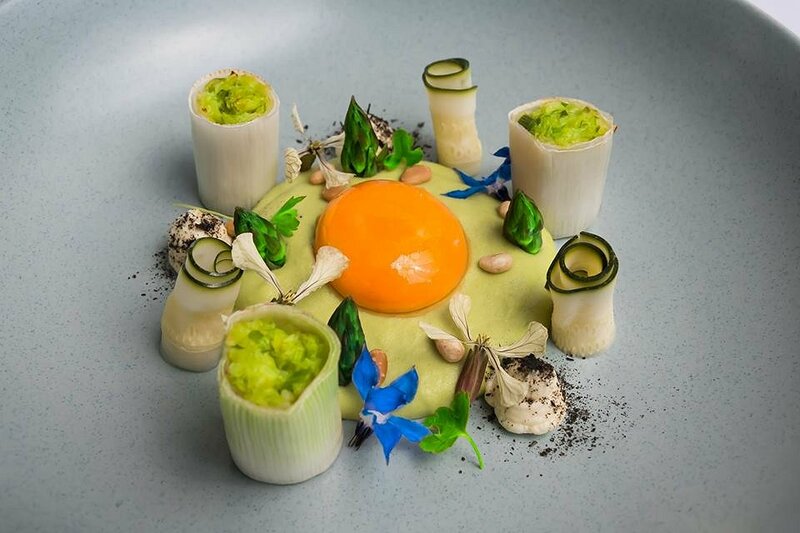 A multitude of components work together; toasted pine nuts, asparagus tips, leek ash, flowers and micro herbs but the star attraction is the namesake of smoked leek mousse piped into hollowed leek cylinders. As you eat them the smooth mousse pops out, filling your mouth with a smoky delight. Rounds of pickled zucchini and whipped chevre round the dish off nicely. Now a Bruschetta is not something you would expect to find on a fine dining menu, but this is no ordinary bruschetta. Instead of the regular bread this base of this dish is toasted buckwheat and brioche crumb which provides a textural triumph. Confit tomatoes are enhanced with basil gel and leaves, their flavour fresh despite their squishy texture. A round of creamy burrata crowns the plate, the tantalizing soft cheese, tomato and basil trio showing why its such a classic. An unexpected addition of pickled strawberries adds a surprising moreish kick. I always find it hard to go past pork on a menu and Serafino’s Berkshire Pork was divine. Again, Chef Armon uses classic parings, this time pork with fennel, white bean and apple. Aside from the perfectly executed pork belly (something I am getting used to from this kitchen) and its textbook crispy skin, the fennel emulsion was to die for. Bringing a bright and fresh aniseed flavour, it contrasted with the creamy richness of a white bean puree. Finished with pickled golden raisins, pan seared squid and a dusting of apple candy this pork entrée will set your meal off on the highest of notes. 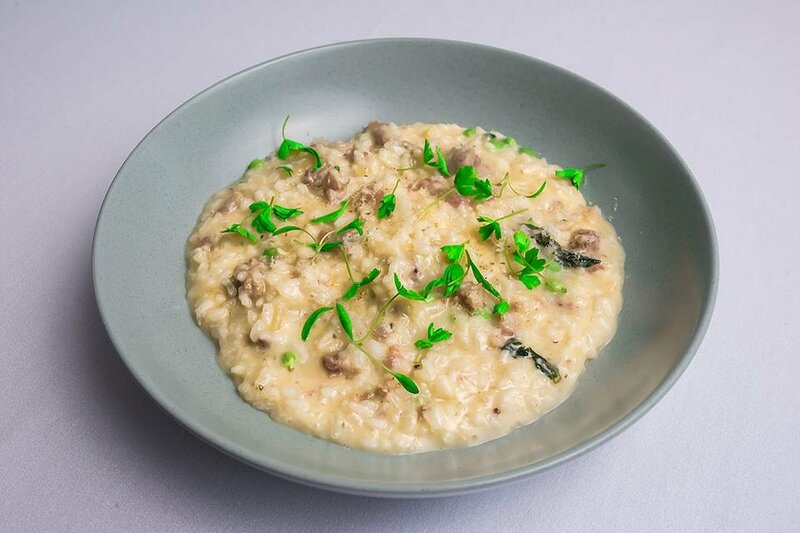 Moving onto the main courses, it’s easy to overlook a Risotto on a menu given how frequently they are poorly done. This super cheesy concoction will not disappoint. The pork sausage almost melts into the bowl of creamy deliciousness. The addition of preserved lemon adds a citrusy lift as do the scattering of al dente peas which provide a nice texture change. Today the Market fish was Golden Cod, the flesh incredibly delicate under a crispy skin. To say the fish is perfect is an understatement. 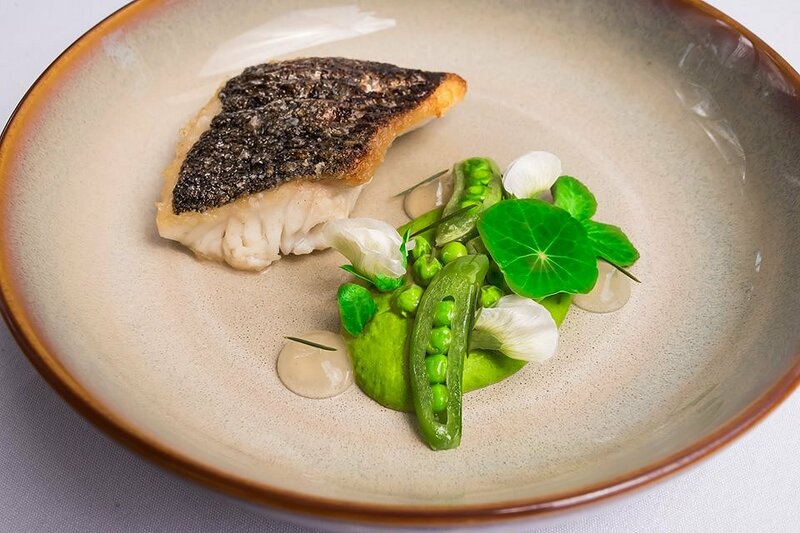 Again, in making the most of the season a celebration of spring peas accompanies the fish, various pea variations, lemon gel, and sprigs of Geraldton wax. Lemon and fish is a match made in heaven so here we see a vibrant lemon gel that lifts both the spring peas and fish. The menu’s top seller is Veal & Prosciutto and for good reason. 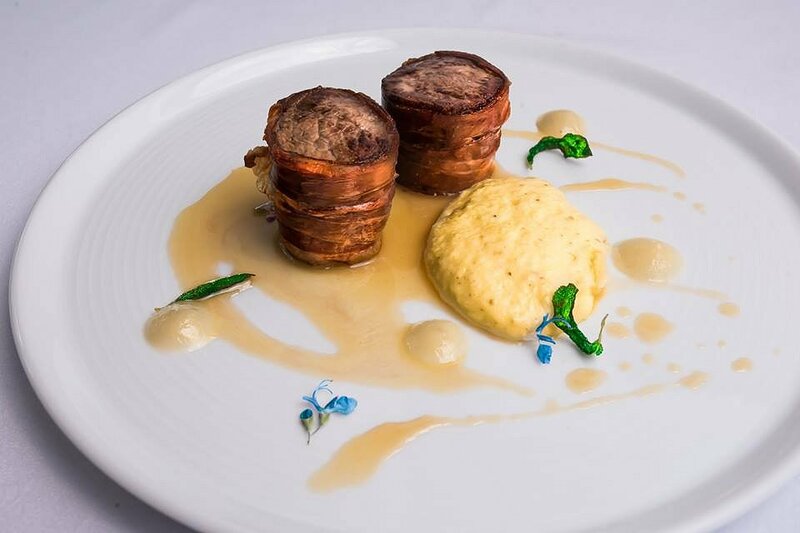 The veal medallion wrapped in prosciutto is delightfully tender having been cooked sous vide before being finished in the oven for colour. Loves of truffle will adore the creamy polenta and I loved the delicate teaming of pear and moscato in a fruity and flavourful gel. Expect great things from new Pastry Chef Kellie Grech who is serving up some of the best desserts around. 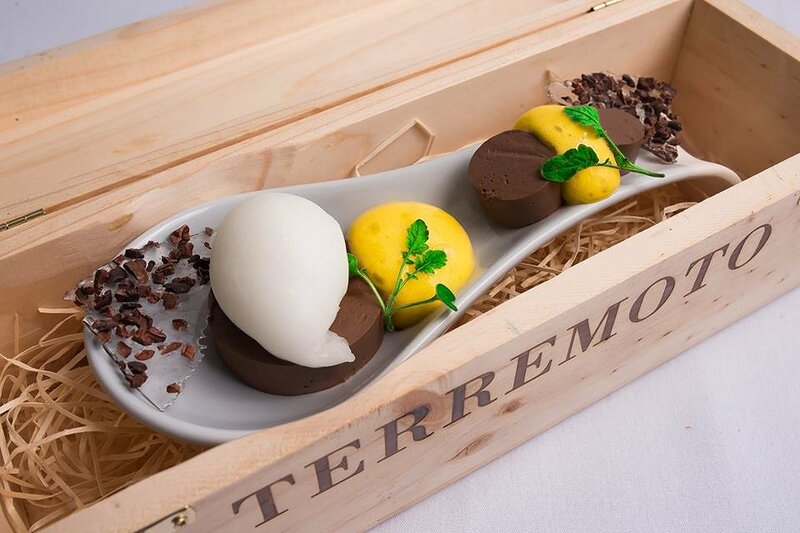 There’s a Smoked Chocolate Mousse presented in a wine box – the smoke making its escape when you open it at the table. A modern twist on Banoffee pie with a delectable banana and caramel macaron, banana infused dulce de leche and milk crisp, but for me the easy favourite was the Lychee & Strawberry dessert featuring a refreshing lime and yoghurt panna cotta and the most delicious lychee and white rum sorbet that tastes like the best mojito you’ve ever had. With a heavenly strawberry consommé poured over the top this is hand down the best finish to a splendid spring meal. Its hard to pick favourites in this menu that really does celebrate the spring season and its lively flavours. Each dish has its own complexities and multiple elements in order to create balance and harmony. Gels, emulsions, pickles and dusts are used to create layers that ensure each dish is of the highest possible standard. 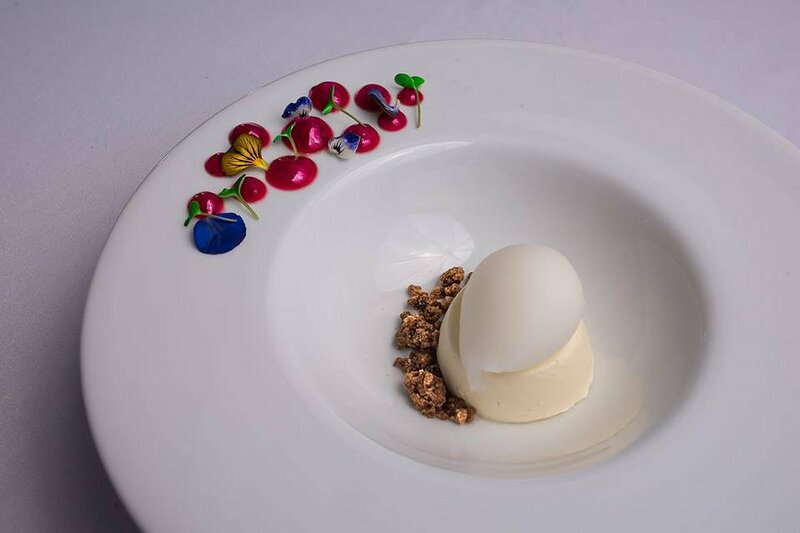 Not only is every dish supremely delicious but each one is a work of art.